Not every dollhouse or dollhouse scene needs figures. Some people love them, some don't. Here are some tips on choosing the right type of doll for your setting, as well as what are the hardest things to find in miniature dolls. Miniature or dollhouse dolls are often difficult to choose, and for some periods and settings, difficult to find. They are constructed of many materials and assembled in many different ways, with a range of finishes. The majority of dolls are chosen for their costume and pose not their features. Scale fabrics are difficult to source so costume plays a large part in most people's decisions on which doll will move into a scene. Dollhouse dolls should be the correct scale and period dress for your dollhouse setting. Consider how you want the doll to pose. Do you need a standing doll with a raised arm, a sitting doll, a doll that can hold something it its hand? There are several makers of doll kits in resin and porcelain. Kits are fairly easy to assemble and a good way to learn about dolls before you start collecting. In general, modern 1:12 scale male dolls are approximately 6 inches tall and females are 5 to 5 ½ inches tall. You can see the various doll scale sizes represented on this scale check. There are no standard sizes, which makes purchasing clothing tricky. The Heidi Ott doll range does come in some standard sizes so purchased clothing is possible. Porcelain/bisque dolls can have very realistic skin tones and expressions. They tend to have soft generalized features. Higher quality modern porcelain dolls have more realistic expressions, better hands and shoes, and more detailed wigs and clothing. 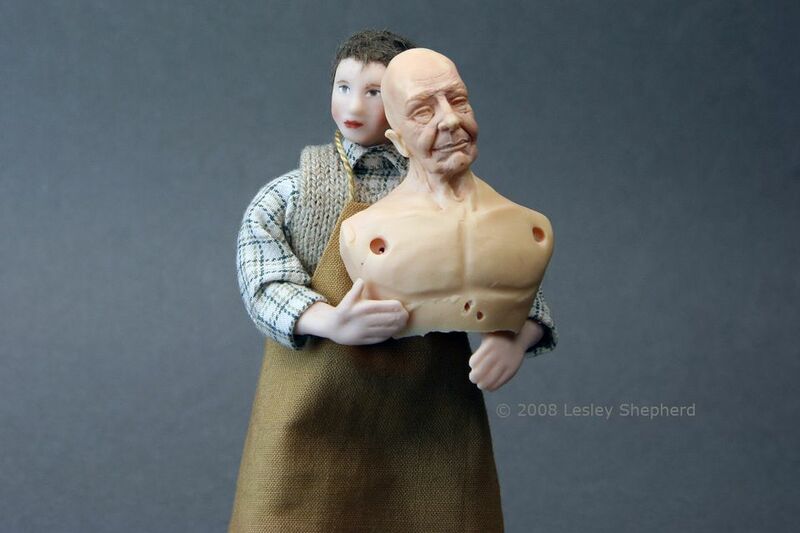 Several makers produce fully poseable dolls with varying types of joints. Porcelain dolls are fragile, and fingers, heels, may chip or break with use. Doll makers use their own molds, or molds from other makers, so similar dolls are available from several sources. Inexpensive mass-produced glazed porcelain dolls are available primarily for play by older children. Porcelain dolls are available as parts, kits, molds, undressed dolls, dressed dolls and dolls with fully removable clothing. Plastic dolls are primarily for play. Some have poseable bodies, others have traditional moving arms and legs. Mattel toys now make a range of action figure characters which at 6 inches are slightly larger than dolls house scale. Polymer Clay Dolls Polymer clay allows the production of highly individualized dolls. Many doll artisans sculpt character dolls from polymer clay and some will create dolls from photographs. Polymer clay lends itself to faces which have wrinkles, sags, and which do not fit the generic face more often found in porcelain dolls. There are some makers who specialize in generic face dolls in polymer clay. For an excellent reference book for polymer clay character figures, see James Carrington's "How to Sculpt 1:12 Scale Character Figures for the Dolls' House " or you can view the photo tutorials on how to sculpt your own miniature dolls and figures from polymer clay. Resin Dolls These are most often found as inexpensive static figures with cast resin clothing. They are useful for simple scenes where several characters are required. There are some doll artisans who work in resin, or who have less expensive resin kit molds of their original polymer clay creations. Resin figures can be cut, glued sanded and reshaped with epoxy putties. Resin may discolor in UV light. Felt, Fabric, Wood, Paper Mache Dolls Most of these fit the collector or artisan doll category. They are often used for a particular period or historic based houses. Poseable dolls have either wires connecting the various body parts (hands and feet to shoulders and a torso)or ball jointed sockets threaded on wire. Higher quality dolls use stronger, more malleable wire. Inexpensive dolls may use pipe cleaners to connect hands to shoulders. If a doll will be used and reposed often, a better wire construction or a ball jointed doll is advisable. For a doll posed for a long period with few changes, a simple kit doll with pipe cleaner/wire connections may be fine. Will your doll wear short skirts or shorts? It will need visible molded knees. Short sleeve or sleeveless dresses or shirts? It will need a full arm or a full torso, instead of just a wrist and hand. Will you need it to be able to bend or turn at the waist? It will need a bendable waist which allows a turning movement. Will its neck be covered? If so you can get away without a neck or chest. For a low cut gown or summer t-shirt, you will need a doll whose head extends down with a neck into the torso. If the neck is not covered, will the head need to move? What type of joints will your doll need to tilt or turn its head into a natural pose? Will the doll be dressed/undressed frequently? Does the doll's construction allow for easy removal of clothing, or will wigs need to be removed when clothing is changed as well? Does the doll's construction allow for all types of clothing? Dolls with cotton fabric bodies may not be able to show off sleeveless evening gowns, dolls with ankle height legs are restricted to long dresses). If permanently attached clothing is desirable, will the dolls clothing style restrict poses or placement of the doll? Does this work for your dolls house display? Does the doll need to be fully poseable, will the poses be changed often? If so, the ball jointed dolls of the Heidi Ott type are probably preferable to a doll made with pipe cleaner or simple wire joins. Will the doll need long arms, legs to the knee, a neck and chest or will these areas be hidden by clothing. Will the hair need to be changed (can wigs be removed or are they glued in place).